I had the opportunity to visit Havana, Cuba on a humanitarian mission early in January and was inspired by what a single individual can do to protect Place, while providing employment and improving the local economy. 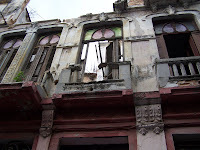 Once considered the "Paris of the Caribbean," Havana has fallen into terrible decay over the last 50 years as little has been done to maintain the rich architectural heritage. While art, community, music, and dance have flourished in Cuba, the wild eclecticism of architecture that helps make Havana a unique Place is in a state of decrepitude and collapse. But recognizing how vital Havana's built environment is to Cuba's lure as an international tourist destination (as well as its importance in culturally rooting Cubans), one visionary man seeks to preserve much of what remains. Eusabio Leal Spengler, Havana's City Historian, has worked tirelessly despite inadequate funds and innumerable hardships, to ensure that Havana's significant architectural treasures are preserved. While we were there, we saw the results of his work. Blocks and blocks of Spanish colonial, French belle epoche, Italian renaissance, and Gaudi-esque art nouveau buildings have been brought back to their original glory, and some of the squares are as grand as Prague, Paris, and Rome. So much more remains to be done as every year more treasures collapse from rot and neglect. But Eusabio Leal's office continues to make major strides in preserving Old Havana, while employing thousands of skilled workers and attracting hundreds of thousands of cultural tourists. Many of our American cities could benefit from persons with similar vision and perseverence, especially in today's troubled economy. Perhaps one of the best things we can do to protect our future, is to preserve those things that make our cities real Places.